Everlasting snow. Centuries-old pine-trees. Fresh air of hazard to revive you. 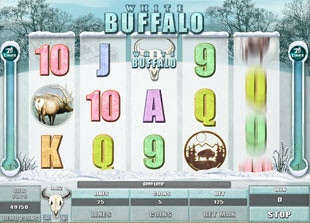 Microgaming tries to collect the best of winter season in its White Buffalo slot machine. Of course, Free Spins are guaranteed. 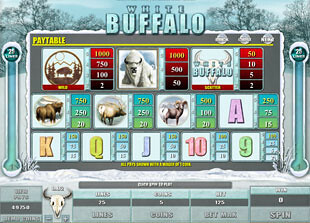 The irony is that being released in June 2012, this slot invites into snowy mountains of gold. 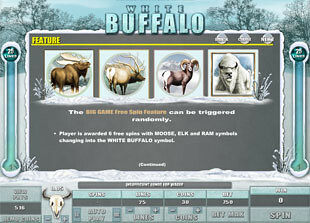 Play online with 5 reel 25 paylines to catch sacred animals and get your so awaited award. No download format promises you easy access to the game with no extra software to download onto your device. Brown Buffalo symbols are wild. Yeah, they know no civilization in their natural life but still are kind enough to substitute for other icons as well. The only exception is the scatter. The wild symbol also presents you the top prize. Just catch 5 of them to win 1,000 coins. Skull is the scatter symbol. Its winning combination can’t be completed by other symbols. Only three or more scatters can guarantee you the attractive prizes equal to 2, 5, 10 and 50 times multipliers. There are 39 twisting paths in the forest of prizes. This is the number of winning combinations available. To step on the road of wealth you should play with $0.01 or $0.20 coin size. With the maximum of 30 coins per line you can increase your bet up to 750 coins. Play with $0.02 to bet up to $150 per spin. Thus, the top jackpot of 1,000 coins can be converted into $6,000. To win such a prize you need to meet 5 White Buffaloes or 5 Wild symbols. The bonus feature of this slot is Free Spins. Actually, there are no too many of them. Just 6 Free Spins to enjoy. However, there is some option you will definitely like. All the symbols of animals – Moose, Ram and Elk are turned into White Buffalo. Yeah, the very symbol that brings you the top jackpot! Now imagine how much you can win during your bonus feature. Free Spins are triggered at random. What is more, you can retrigger them as well. To be honest, to activate Free Spins is not so easy. I’ve been playing for an hour or so… and nothing. However, we can’t talk about some tendency or whatever. These are slots. They are unpredictable. And maybe you will be the lucky one who hits Free Spins feature from the second spin. Who knows. If tired to spin the reels, but still want to find out what prizes are waiting for you at random, this slot has some nice option for you. Activate Expert Mode with Autoplay option. You can set 25, 100 or even 500 spins to enjoy without constantly clicking on buttons. Set the number of coins per line, coin size and voila! Reels are spinning automatically. Just catch the moment when your prizes are won. 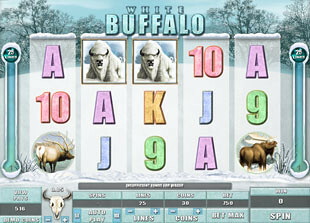 Play free spins slots to catch falling snow of white expectations.